The database improvements we made to SHERPA/RoMEO in August 2011 have enabled us to generate new statistics on the number of journals that permit self-archiving. We presented a provisional pie chart of journals broken down by RoMEO Colour at Open Repositories 2011. This is updated in the following chart, which uses a snapshot of the RoMEO Journals database taken on the 15th November 2011. Like RoMEO Colours, this chart is based on strong open access, where there are no embargoes or restrictions that prevent immediate self-archiving. 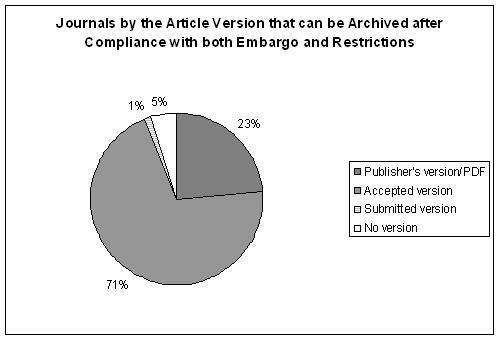 As with the colour chart, this shows that 60% of journals allow the final peer-reviewed version of an article to be archived immediately, with a further 27% permitting the submitted version (pre-print) to be archived immediately. This chart takes account of embargoes of any length. The most common embargo period is 12 months, followed by 6 months, and then 24 months. A few embargoes are longer, the maximum recorded in RoMEO now being 5 years. 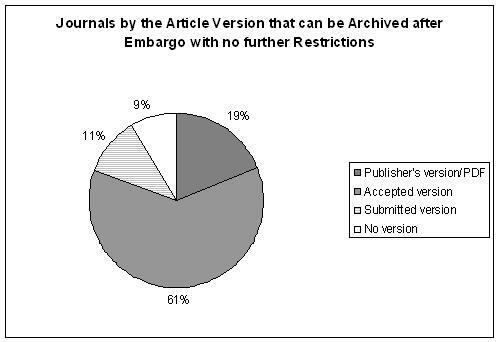 This chart shows that a remarkable 94% of journals allow archiving of peer-reviewed articles after any embargo period has expired and any addional restrictions have been complied with. Indeed, for nearly a quarter of journals, the publisher’s version/PDF itself can be archived. 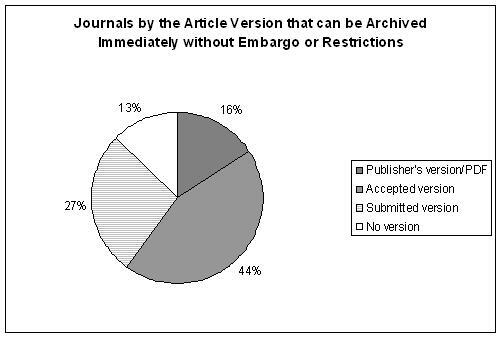 Just 1% of journals only permit the pre-peer review submitted version to be archived. This leaves only 5% of journals that do not permit self-archiving of some form or another. On the date the data for these charts was compiled (15th Nov.2011), the RoMEO Journals database held about 19,000 titles. Unfortunately, assigning journals to policies is not an exact process, due to the vagueness of some publishers’ policies and the fact that some publishing houses do work for societies and other third parties whose own open access policies may take precedence. It is therefore difficult to gauge the precision of these figures, but we guestimate that they are accurate to within 2%. 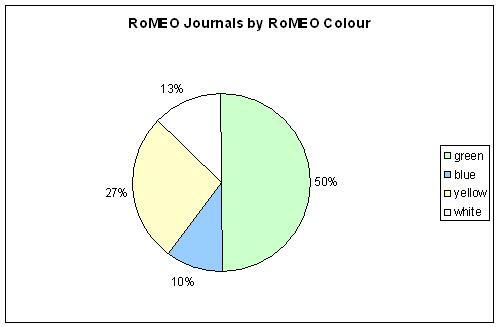 The charts do not take into account journals that are not covered by RoMEO’s own database, but we expect that the relative proportions would be similar. Posted by romeo on November 24, 2011 in Journals, RoMEO. I wish that all the India publishers should share their publication policy info with Sherpa/RoMEO. There is a default policy in India for print publications…. All Rights Reserved…. I am very concerned about whether I may be breaking copyright laws and the info you have here does not specifically help me see if my own articles are free to be uploaded here at academia.edu How do I find specific information about journals such as the Journal of Orhthopsychiatry, the Journal of Feminist Family Therapy, the Journal of Marital and Family Therapy, and Family Process? Thanks!